Plot synopsis: A verse-play for radio about a wartime bombing raid on a small town. Review: Originally written in 1938 - on the cusp of World War II - this radio play presciently predicted the horrors of modern warfare as they affect not just soldiers, but civilians. It does so by presenting an unidentified small-town community about to be struck by a bombing raid, with a particular focus on its womenfolk. It has to be noted that its depiction of the women is not exactly progressive: as a group, they are blinkered and pretty stupid, completely disbelieving that they will be affected by the war that has engulfed their nation simply because they are civilians. Perhaps most shocking to modern ears is the way they simply laugh off the possibility that some of them may be raped (or 'rumpled' as it is euphemistically described) by enemy soldiers, as something that would be little more than a minor inconvenience. The plot is in fact rather so-so, but what remains of greater interest today than the play itself is the circumstances of its broadcast. This reprisal of the play, coming nineteen years after its original airing, places it in an entirely new context: the Cold War. As such, the impending attack it features becomes a qualitatively more terrifying one, in the light of the advent of the nuclear age. Indeed, more frightening than anything in the play itself is the coda at the end (part of which I quote above), in which the announcer warns listeners of the then seemingly very real prospect of nuclear annihilation. This serves as a chilling reminder of the climate of fear and anxiety that permeated the Cold War era. Plot synopsis: An analysis of Shakespeare's Hamlet that argues that Hamlet is the true villain of the play. Review: The writer John Updike once argued in an essay that 'Hamlet is in fact the callous, egocentric villain of Hamlet'. This episode (produced many years prior to Updike's piece) takes a similar line, developing a sustained case for seeing Hamlet in a much more negative light than is conventionally the case. According to the characterization presented here, Hamlet is in turns petulant, ungrateful, conceited, deranged and cruel - cruel especially in his treatment of poor Ophelia. This not to mention that he is a multiple murderer, and even a traitor to his country! By contrast, his mother and stepfather, Gertrude and Claudius, are widely misunderstood, in fact having Hamlet's and Denmark's best interests at heart. Despite how this all may sound, the episode is not a dry, academic exercise in literary analysis, but is done in a very light, playful way, making this a very entertaining listen. Still, what is most interesting about the episode is the mere fact that it was made - to have devoted a whole episode of a radio show aimed at a mainstream audience to analyzing a Shakespeare play is incredible, and it's difficult to imagine a popular radio or TV programme doing the same today. Furthermore, the episode simply presumes that its audience is familiar with Hamlet's basic plot and characters - how many contemporary radio or TV broadcasters would presume the same? Evidence, perhaps, that modern producers have been responsible for a severe dumbing down of mainstream popular entertainment. 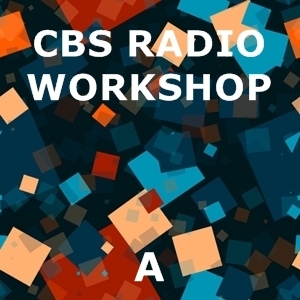 In any case, it's also striking that this was not even the only CBS Radio Workshop episode devoted to Shakespeare (see also Colloquy No.1 - Interview With William Shakespeare), showing that there was a time when examining 'high art' and aiming for a general audience were not believed to be incompatible goals.